Our lives, sometimes, take unexpected turns. We may suddenly find ourselves in the middle of a storm. There will always be challenges and struggles for all of us to go through in life. Sometimes, we may even find ourselves at the end of the road, with nowhere to turn. You may be right in the middle of a hopeless situation— with your job, career, education, home, marriage or family. So many things in your life could have gone wrong. Let me encourage you that the God of the Bible specializes in giving life to the dead—to situations and circumstances that seem dead and hopeless. He specializes in turning hopeless situations around. With Him on your side you can hope even when there is no reason to hope. Even when everything seems hopeless, you can come out a winner. 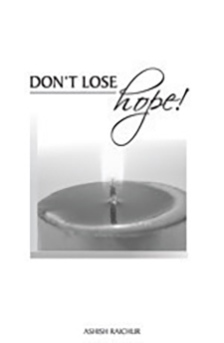 This book brings simple words of encouragement and exhorts us not to lose hope. Have hope in God and in His Word. Recollect what God has spoken concerning your life. DON’T LOSE HOPE!